2 day classes for 1.5 hours each day giving you the opportunity to work with Amber Hawkins. She will give you tips for working with the 45 degree angle ruler, fussy cutting and pattern reading. 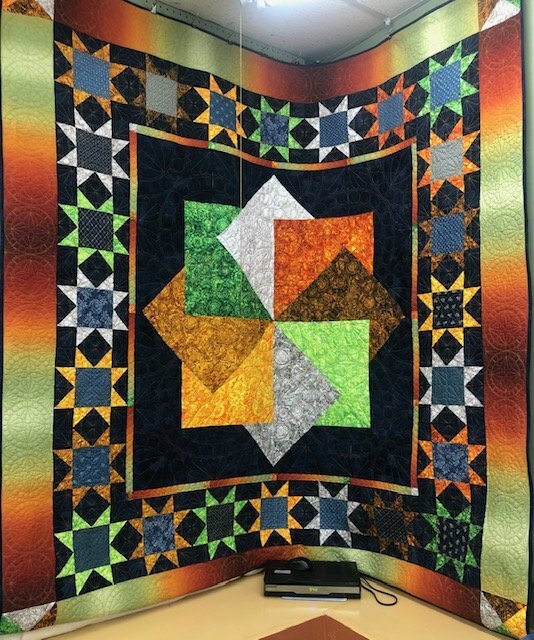 Amber worked with Ombre Bohemian Rhapsody Fabrics by QT and Falling Leaves by Maywood Studio (border) to create the beautiful quilt pictured. Pre-pay for the class, ruler and pattern at time of sign up. You pick your own fabrics. 15% discount for class supplies. Call 913-422-4501 or come into sign up. You really don't want to miss the opportunity to work with Amber. Comfortable with cutting and piecing fabrics to create quilt tops. Purchase your fabrics. 15% discount for class supplies. Price includes 2 days of instructions.